Four decades ago, the simple but noble vision of a businessman, Franciso Abanilla, and his wife Zenaida, a school teacher, of providing quality education to the youth of the rapidly growing community of San Pedro was turned into reality when Mrs. Abanilla started a tutorial class for kids between three and five years old and experimented on a different touch of learning experience. This paved the way to the birth of “Quality Kindergarten Schoolhouse” right in the very residence of the Abanillas. It adopted the Montessori Approach which mainly focuses on the individuality of the child. It then continued to grow and further develop as it consistently provided quality education to children even from neighboring communities. QKS’s constant good performance was consequently acknowledged by the then Department of Education Culture and Sports (DECS) through the issuance of a certificate of recognition on January 23, 1981.The year after, QKS was renamed Quality Kindergarten and Grade School as it began offering the Elementary course, starting with the Grade One level while the subsequent grade levels were added during the succeeding years until it was completed in 1988. Throughout those years, the school has steadily built a good reputation with its name almost becoming synonymous with quality education. It therefore did not come as a surprise when DECS likewise granted a certificate of recognition to its elementary course on October 21, 1987. In 1988, it was renamed SAN LORENZO SCHOOL in honor of the first Filipino Saint (canonized by St. John Paul II who was then still a Pope), who was instrumental in the miraculous healing of Mr. Abanilla from a malignant disease after being taught to pray for his intercession. After 19 years of catering to pre-elementary and elementary pupils, and as a response to the persistent demands for secondary education, SLS finally started offering high school courses adopting the entrepreneurial approach and had its first batch of high school graduates in 1999. Due to its consistent impressive performance in Math and Science, SLS was given the approval to operate the Science Curriculum during the school year 2000-2001 and saw its first batch of Science High School graduates in 2004. During the school year 2006 – 2007, Mrs. Abanilla’s dream of providing a house of prayer for every Sanlorenzonian was realized with the construction of the school chapel which was duly consecrated on September 28, 2007, San Lorenzo Ruiz’ feast day. On October 22 of the same year, the beloved founder and directress passed away and joined our Creator. She was succeeded by her son, Mr. Francis Abner Abanilla whom she had trained while she was still alive. Through the years, San Lorenzo School has unfailingly proven itself to be a helpful partner in the total development of its students with the help of past and present members of the faculty and staff who significantly contributed to the school’s growth like Mrs. Miriam Berroya, Mrs. Corazon Chavez, Mrs. Wenelyn Torremana, Mrs, Cristeta Manebog, Mrs. Lea Almoro, Mrs. Grace Reyes, Mrs. Teresita Sabater, Mrs. Esperanza Fermin, Mrs. Iluminada Sena, Mrs. Adoracion Almeida, Mrs. Amelita Lupena-Escalona, Mr. Andy Triguero, Mrs. Agnes Bondoc, Mrs. Ma. Socorro Moncada and the late Mrs. Norma Garcia, Mrs. Paula Taliman and Mrs. Zenaida Silos. During its first 20 years, SLS has successfully prepared its students for the high school level with a high passing rate of Philippine Science High School and Manila Science High School applicants and topping the National Elementary Achievement Test (NEAT). The following 2 decades demonstrated San Lorenzo School’s commitment to uphold moral and academic excellence by continuously topping the NEAT and NAT and building a strong foundation of academic ascendancy among its students who went on to college, finished their degrees, and became contributors to nation building, locally and globally as Doctors, Engineers, Lawyers, Teachers, Businessmen, CPAs, Artists and many more. At present, with the entire Philippine educational system being at a critical turning point due to the challenges brought about by the K to 12 curriculum and ASEAN integration, San Lorenzo School looks forward to the next 20 years especially with the permit to operate Senior High School, granted recently by the Department of Education, offering different strands under the Academic Track such as the Science, Technology, Engineering and Mathematics (STEM), Humanities and Social Sciences (HUMMS), Accountancy, Business and Management (ABM) and General Academic Strand (GAS); and various Technical-Vocational strands such as Beauty and Nail Care, Hairdressing, Bread and Pastry Production, Cookery, Dressmaking, Computer Hardware and Servicing, Computer Programming, Technical Drafting and Electrical Installation and Maintenance. 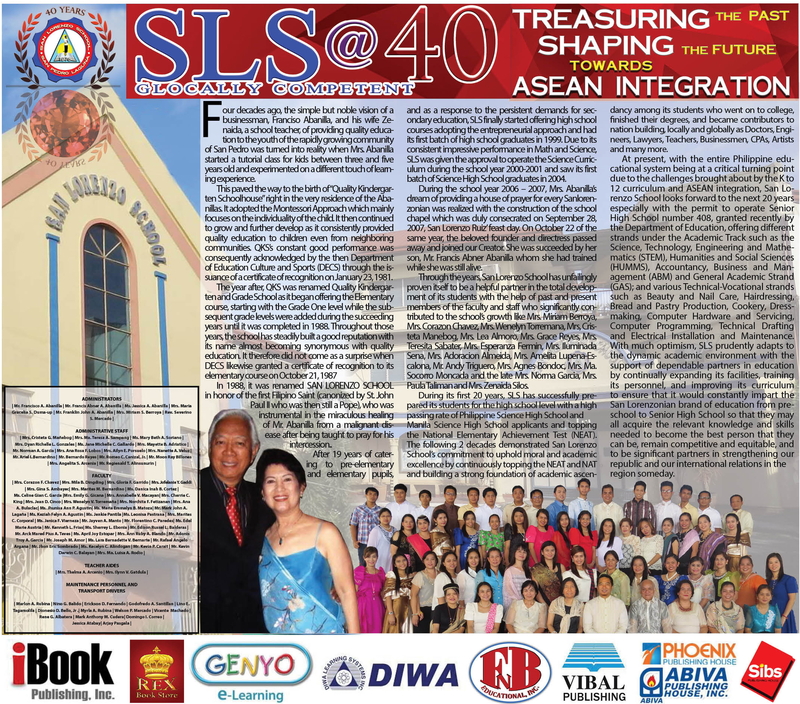 With much optimism, SLS prudently adapts to the dynamic academic environment with the support of dependable partners in education by continually expanding its facilities, training its personnel, and improving its curriculum to ensure that it would constantly impart the San Lorenzonian brand of education from pre-school to Senior High School so that they may all acquire the relevant knowledge and skills needed to become the best person that they can be, remain competitive and equitable, and to be significant partners in strengthening our republic and our international relations in the region someday.